All American Bathroom Stalls | All American Metal Corp.
All American Metal Corporation has been around for almost of a half century. This partition manufacturer produces superior products that are attractive, modern, and built to withstand a lifetime of use. 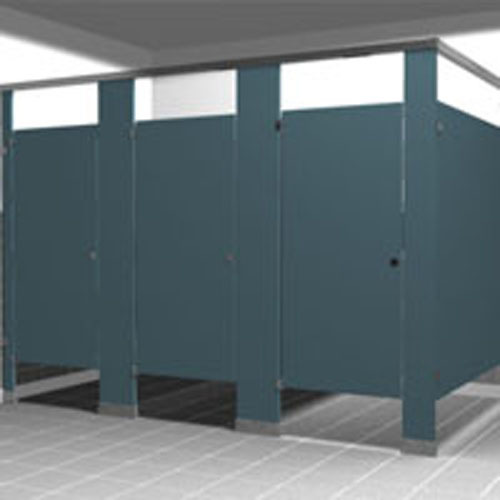 All American bathroom stalls are available in a variety of colors as well as five materials that include powder coated steel, stainless steel, HDPE solid plastic material, solid phenolic and plastic laminate. When ordering an All American restroom stall you can select one of the following installation options: mounted as floor anchored with overhead braced installation, ceiling hung, floor anchored, or floor to ceiling anchored. Powder Coated Steel Toilet Partitions — All American’s powder coated steel stalls are durable and offer quality at an affordable price. They’re created with the strength of steel and a finish to protect the partitions from fading or staining. This material is available in headrail braced, floor supported, ceiling hung and floor to ceiling mounted. Stainless Steel Toilet Partitions — All American’s stainless steel partitions come in a satin #4 brushed finish. This is a great material for high traffic restrooms, because it resists corrosion, resists rust and staining, and is easy to clean. This material is available in headrail braced, floor supported, ceiling hung and floor to ceiling mounted. It also includes a 10 year warranty on material defects. HDPE Toilet Partitions — All American’s solid plastic panels are constructed of 1” thick solid plastic. They make a very popular choice for high volume restrooms or showers because of their high durability. This material is available in a wide variety of colors and has color throughout the product, which means delamination will never occur. The material is waterproof and is resistant to denting and vandalism. All bathroom stalls in this material are available in headrail braced, floor supported, ceiling hung, and floor to ceiling mounted. These stalls come with a 15 year warranty against corrosion and breakage under normal ware and use of product. Plastic Laminate Toilet Partitions — All American’a plastic laminate partitions are available in a wide range of colors and patterns. They provide a smooth exterior and they are very easy to clean. This material options is available in headrail braced, floor supported, ceiling hung, and floor to ceiling mounted. Black Core Phenolic Toilet Partitions — All American’s black core phenolic stalls are manufacturered with a solid phenolie core. These partitions are only available in headrail braced mounting, but they do come with a large selection of colors and patterns. The material is resistant to water, impact, and staining. This material option has a 10 year warranty against delaminating, corrosion, and breakage under normal ware and use of product. All American’s bathroom stalls and partitions are compliant with all ADA Code requirements and they’ve been manufactured in an environmentally responsible manner. This makes All American an excellent option for building a new restroom or updating an existing restroom. When using All American Metal Products in conjunction with a LEED The Leadership in Energy and Environmental Design (LEED) Green Building Rating System ® on a construction site, your project can earn points for recycled content, local regional materials, rapidly renewable materials, certified wood materials and low emitting materials based on the material of the product selected. All American Metal bathroom stalls are shipped out of Freeport, New York. Orders will be processed and shipped approximately 2-3 weeks after the order is placed. The material type selected can alter this timetable slightly. All American’s replacement parts and hardware are also readily available and in stock to ship quick. If you’d assistance with material selection process, layout design, pricing, and/or ordering options, we’d be happy to help. We can provide assistance with existing restroom renovation or new construction projects.